COREtec Plus Vinyl Tile Flooring | Alcher Interiors, Inc. It really is a dream come true – a 100% waterproof floor with a lifetime residential warranty. COREtec flooring is an easy-to-install product with little- to no-floor prep – depending on your existing floor. Whether you currently have ceramic tile, hardwood or even concrete flooring, you can transform your worn out surfaces with little effort. And it doesn’t cost a fortune! Are you tired of being a slave to maintaining your wood floors but really like the look of wood? COREtec Plus by U.S. Floor is the perfect solution. If your current ceramic tile or stone floor is chipped or looks dated and no longer fits with your décor, COREtec laminate flooring might be the right answer for you. 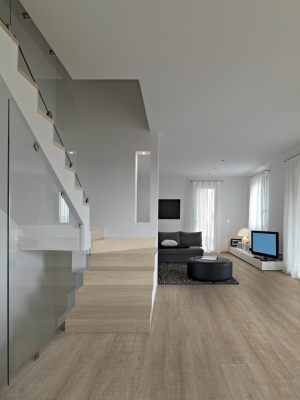 COREtec flooring is available in either a wood or a tile finish. The wood look gives homeowners a choice of 5” and 7” wide planks that click together to form a tight seal. With 24 different domestic and exotic wood finishes to select from, there is something for everyone. COREtec’s tile options come in either 12” x 24” or 18 1/2” x 24” formats. Eleven tile selections offer slate, stone, travertine, marble or the latest stamped concrete looks from which to choose. The wide plank and large format tile sizes give you a modern, up-to-date look. You can even combine the wood panels with the tile for a truly unique flooring pattern. Ask us how! Low maintenance COREtec Plus flooring has combined a best-in-class wear quality layer with great-looking luxury vinyl over a core that will not expand or contract with temperature or humidity. They’ve added a cork base for comfort. COREtec flooring is made of four layers. The top layer consists of 2 coats of a 20 mil commercially rated acrylic. Next is the luxury vinyl layer with excellent wood and tile graphics in an assortment of colors and finishes. The third layer is the COREtec Plus Patent pending material which is similar to decking. 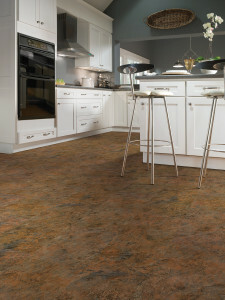 The last layer is cork which has several structural and comfort advantages. It’s also a renewable material which resists mold and mildew. COREtec is a hardwearing floor so the easy answer about where to use COREtec is anywhere there could be moisture issues, spills or heavy use. Use COREtec in areas such as your kitchen, bath, home entry way, mud room, or laundry room – and it is perfect for basements that may be a little damp. COREtec is also a great choice for those homes where heat is turned off (or down for long periods of time). And for extra comfort, COREtec can be installed over a heated floor in a family room, game room or great room. Wondering about the manufacturer of this exciting product? U.S. Floors was founded in 2001 in the Appalachian Mountains. Their forward thinking management team was the first manufacturing company in Georgia to use solar panels to generate clean energy. COREtec flooring is Green Guard certified, which means it has low chemical emissions to protect your home. Let Alcher Interiors help you transform your tired space with great-looking and low maintenance COREtec flooring.